＝Kono kuruma navi tsuite naino? = This car doesn’t have a navigation system? = Menkyo motte nai kuseni! I will teach you how to use くせに ( = 癖に = kuseni) today. 準備はいい？(= Junbi wa ii?) Ready? くせに means “although” / “despite” / ” even though” / “even if”. We use くせに when we accuse / tease/ criticize someone. It shows speaker’s contempt, dissatisfaction. In case you haven’t seen my のに ( = noni) lesson, please go check it later. 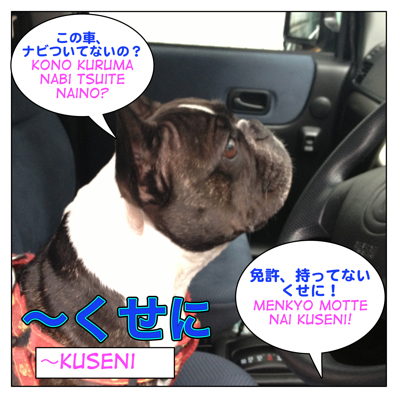 Compare to のに(=noni), くせに(=kuseni) is more negative, stronger and judgmental. Though it is not a bad word and you hear it often in conversation, you should be careful who you use it with and when to use it. = Inu nanoni nihongo wo oshieruno? = Do you teach Japanese despite being just a dog? = Inu no kuse ni nihongo wo oshieru no? = Do you teach Japanese despite being a dog? It sounds very condescending and looking down on me. If you say that, I might bite you! = Kare wa otoko no kuse ni amaimono ga sukida. = For a man, he likes sweets. = Anoko wa kodomo no kuse ni otonabita hanashikata wo suru. = He(she) talks like an adult although he(she) is a mere child. = Maggie sensei wa nihongo no sensei no kuseni “bara” to iu kanji wo kakenain desu ka? = Though you are a Japanese teacher, you can’t write the kanji “薔薇 = bara = rose(s)”, Maggie Sensei? No I can’t! And so what?? = Okanemochi no kuse ni kechikechi shinaide! = Don’t be stingy. I know you are rich! = Ookii kaisha no kuse ni setubi ga totonotte inai. = It is a big company but it is poorly equipped. = Kare wa isha no kuse ni tabako wo sutte iru. = He is a doctor but he smokes. = Isha demo nai kuseni. = As if you were a doctor! Note : We usually use this form when we refer to people (or animals), groups or entities. = Juunigatsu no kuseni atatakai. = It is warm for December. = Kare wa karada ga ookii kuse ni nani mo dekinai. = Despite the fact he is big, he can’t do anything. = Kare wa utaga hetana kuse ni kashu ni naritai. = Despite being bad at singing, he wants to be a singer. = Kare wa watasih no kimochi wo shitte iru kuse ni mushi wo suru. = Although he knows how I really feel about him, he ignores me. = Kare mada nihongo de hyaku made kazoerarenain datte. = You know I heard he still can’t count up to one hundred in Japanese. = Jibun datte ichinen mae wa juumade mo kazoerarenakatta kuseni. = You couldn’t even count up to ten a year ago either! = Oyatsu bakkari taberu to futoruyo. = If you keep eating sweets, you will get fat. = Jibun datte itsumo tabeteru kuseni! As I said, it often involves negative feelings, but we also use it when we tease someone. = Mou anna hito daikirai! = I hate that guy! = (You’re just saying that.) I know you still like him. = Kanojo wa suguni yakimochi wo yakunda. = She gets jealous so easily. = I know you are happy about it. = Asa takusan tabeta kuse ni mou onaka ga suita no? = Even though you ate a lot this morning, are you already hungry? Note : You don’t usually useくせに ( = kuseni) when you are talking about yourself. = Asa takusan tabeta kuse ni mou onaga suita. = Although I ate a lot this morning, I am already hungry. = Asa takusan tabeta noni mou onaka ga suita. = Ima kara “bara” toiu kanji wo kaku rennshu wo shitekimasu. Jaane! = I go practice writing the kanji “薔薇 = ばら = bara= rose(s)” now. See you! This lesson is translated in Spanish. Our wonderful friend, Orti, volunteered to translate along with a mini lesson on kuseni. I have a question about this sentence. I don’t understand why 〜てきます is added to the sentence. I have read your lesson about 〜ていく＋〜てくる. But why not just say 「薔薇」という漢字を書く練習をします? I don’t see how 〜てくる adds anything to it. Unless… I can only guess that you are implying “I will practice writing the kanji and then come back”? Of course you can say 書く練習をします。but what I meant was I will practice writing the kanji and will be back to this site. You often use that form when you talk to someone on blog, twitter, Facebook…etc. I found this example sentence interesting. At first I thought I understood it perfectly, but I really didn’t until I read your English translation. Then I got it. My translation before I read yours was “He knows how I am feeling (maybe sick/unhappy) but he ignores it”. There is nothing in the sentence that indicates this, so I find it interesting that a Japanese person would naturally understand it because that is their native language/culture/mindset. This is one of those things that I can only learn from coming across it in real life or your blog. Woudln’t it translate to “You aren’t even a doctor.” as opposed to “You are even a doctor.” ? Oh you are right. Thank you for pointing out the mistake. I didn’t realize it until now. Thank you so much for putting a lot of effort on this website. Really luv it so much. It means the same as も but compared to も, だって(=datte) is often used when you complain something. = Watashi mo isshou kenmei ganbatte imasu. = I am also working hard. = Watashi datte isshoukenmei ganbatte imasu. I am glad to hear it’s clear now. I’ve started studying japanese last december, and I just found out about this website today. I have to say, I really loved your lessens sensei. Not only they’re easy to understand but we also get to laugh xD　お世話になります!! Welcome to our site! I am glad you found us. I really enjoyed the lesson! Thank you so much Maggie Sensei :D! Thank you for the nice comment,ninipana❤ I am glad to hear you enjoyed the lesson! 医者でもないくせに。 why is demo why is not ja nai or deha nai? This isvery useful thank you! You can say 医者ではないくせに（=Isha de wa nai kuseni) /(more casual) 医者じゃないくせに(=isha ja nai kuseni) as well. ~でもない is “not even ~” and it sounds stronger.